Weekly Prize Draws for The Audiance ! Free ! -6 x $25.00 Gift Certificates From Love Nest ! 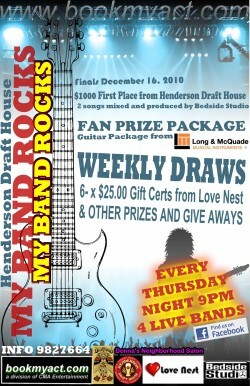 The Big Fan Prize Draw for a Complete Guitar Package! From Long + McQuade Music ! Tag Photos and Share Our Facebook Page to Win the Prize ! Join Host Rodney Rocks ! Every Thursday @ 9pm. Four Live Original Rock Bands !